taiwanese/festival: 2009 beef noodle festival. 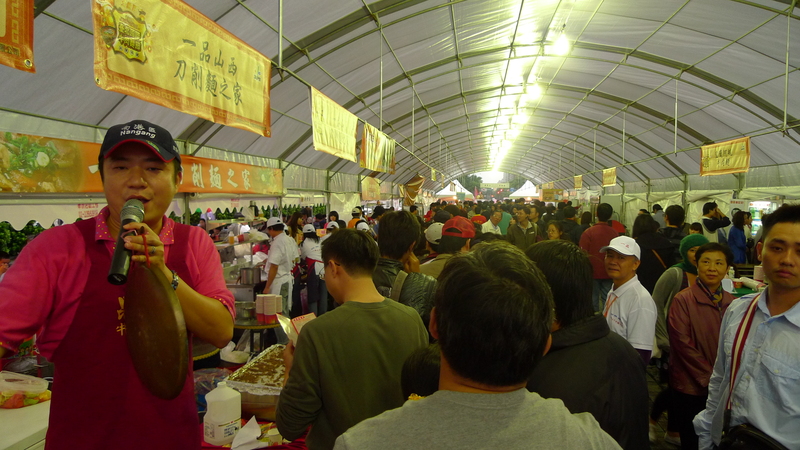 Since the 2010 Beef Noodle Festival is fast approaching, I figured I should write about my experience last year at the 2009 Beef Noodle Festival (aka 2009 Taipei International New Row Mian Festival). I love festivals and try to go to as many as I can, especially ones where the main event is food. I went to the International Food Expo in Taipei earlier this year, and went to the Gilroy Garlic Festival in Gilroy, CA in 2008, so when I heard there was a beef noodle soup festival, I had to go. We went on the last day of the festival around 17:00. Being the last day of the festival and close to closing time we hit the jackpot: buy one get one free! Best thing to do is go with a group. That way, you can share the bowls and try a lot of them. The bowls are not big, they are small cups, but good enough helpings where you don’t want to eat a whole one yourself. 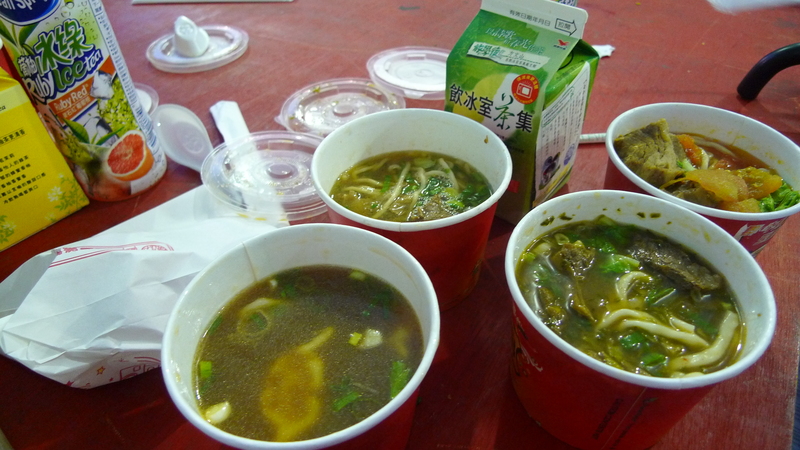 I ended up trying beef noodle soup from 4 stalls all for 100NT (I went in a group of two couples, so we each bought bowls from two stalls, and then since it was buy one get one, swapped bowls). Super amazing bargain. You can get a pamphlet that has all the shops listed who participated in the festival. It’s pretty awesome. They have places to sit and everything is covered, so if it rains, you’re safe-ish. There were lots of people at the festival and it’s not very big, so it’s kind of a mad house. Lots of lines, and lots of people yelling into microphones. It’s kind of hilarious because every stall starts to have specials to get rid of their stock. One stand will start with, buy one get two free, then the stand next to it will be like, buy one get two plus a drink, and so on. Be ready for it to be loud and crowded, but it’s too good to not go. This year’s festival will be held once again at Civic Plaza this coming weekend December 3-5. Festivities will begin on Friday the 3rd at 2pm. Don’t miss out! 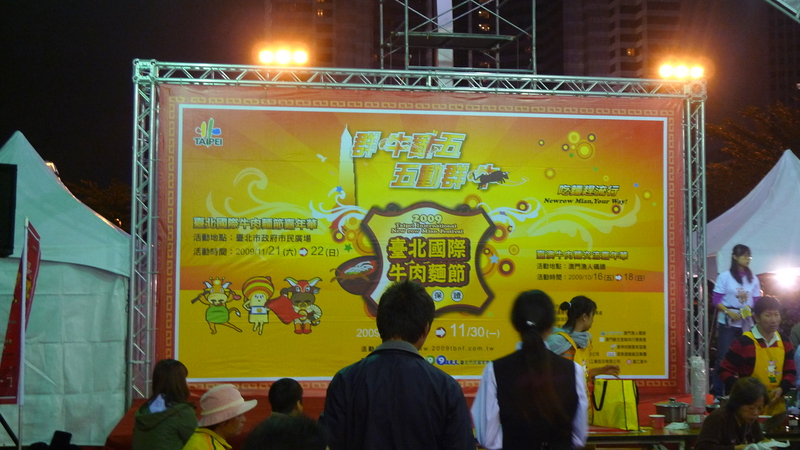 For more information about this year’s Beef Noodle Festival visit the Taipei City Government’s website (English) or the official 2010 Taipei International New Row Mian Festival website (Chinese).